Description: Cap: 10 to 20 cm wide, convex becoming flat with age; cinnamon brown, breaking up into large concentric cinnamon brown upturned scales on a white background. Gills: free, white, becoming red or brown when bruised, darkening in age, close, edges finely fringed, in two or three tiers. Stalk: 10 to 20 cm long, about as long as the diameter of the cap, top 10 to 20 mm thick, thickening to a smoothly rounded bulb at the base, smooth, white, surface darkening when bruised, cut flesh staining reddish or saffron. Ring: white, darkening to brown below with age, thick, persistent, membranous, movable like a ring on a finger, with two edges – one turned up and one turned down, edges fibrous and tattered. Odor and taste: not remarkable. Spore print: white. Habitat: Compost, rich soil, gardens; scattered to gregarious. 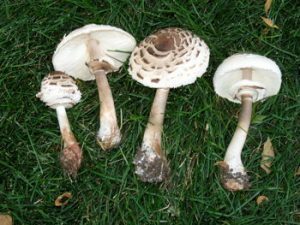 Edibility: Edible and choice, but of the gilled Chlorophyllum species in the Northwest, one or more sicken some people; it is uncertain which because in the past all three were called “Macrolepiota rachodes”. Try a sampler first whenever gathering these from a new area. Notes: This mushroom was first Lepiota rachodes, then Macrolepiota rachodes, now it’s split into three different species of Chlorophyllum. Please see What’s Become of Macrolepiota Rachodes? for details. C. molybdites is a very similar, light-green spored species that causes many extremely unpleasant, but non-lethal poisonings in warmer climates. So far the green-spored Shaggy Parasol has not been reported in the Pacific Northwest, but be very careful collecting Shaggy Parasols in warmer areas. Bring rice, water, broth and salt to a boil. Reduce heat and simmer, covered 40 to 50 minutes or just until kernels puff open. Uncover, fluff with a fork and cook another 5 minutes. Drain off any excess liquid and let cool a bit. Soak Porcini and Shaggy Parasol in 2 C. warm water 10 to 15 minutes or until soft. Remove from water, squeeze dry and chop. Reserve 1 C. mushroom water, avoiding any grit. Melt butter in a large skillet over medium heat. Add onions, celery, Shiitake and a pinch of salt. Saute 5 minutes. Add chopped Porcini and Shaggy Parasol. Saute another 5 minutes or until Shiitake are soft but not browned. Add herbs, salt, pepper and sherry. Cook another 2 minutes. Fold together wild rice, cooked vegetables, bread, reserved mushroom liquid and broth in a large bowl. Put the dressing in a greased large oven-proof container with cover. Cook covered at 350 F for 30 minutes, uncover and cook another 15 minutes. Note: Homemade stock from roasted turkey bones or the pan drippings degreased, strained and thinned 75 percent, will make this more flavorful.